Ivan Duque (second to the right) and the military leadership. Colombia’s President Ivan Duque can declare a state of emergency that would allow him to bypass congress where many oppose the hard-line policies of the president and his political patron, former President Alvaro Uribe. An ongoing increase in violence would provide the president a perfectly legal argument for the far-reaching measure that would allow him to temporarily bypass Congress unless the Constitutional Court intervenes. In the event of a serious disturbance of public order that imminently threatens institutional stability, the security of the State, or the coexistence of citizens, and that cannot be conjured through the use of the ordinary powers of the police authorities, the President of the Republic, with the signature of all the ministers, may declare the State of Internal Disturbance, in all or part of the Republic, for a term no longer than 90 days, extendable for up to two equal periods, the second of which requires the prior and favorable concept of the Senate of the Republic. By means of such declaration, the Government shall have the powers strictly necessary to conjure up the causes of the disturbance and to prevent the extension of its effects. Duque, a 43-year old conservative dynasty politician with long-lasting ties to the Inter-American Development Bank (IADB), has yet to express any interest in such extreme provisional measures. However, the president’s political patron decreed to give himself both executive and legislative powers several times between 2002 and 2010. Several times he was called back after the court found he was abusing his power for the wrong purposes. 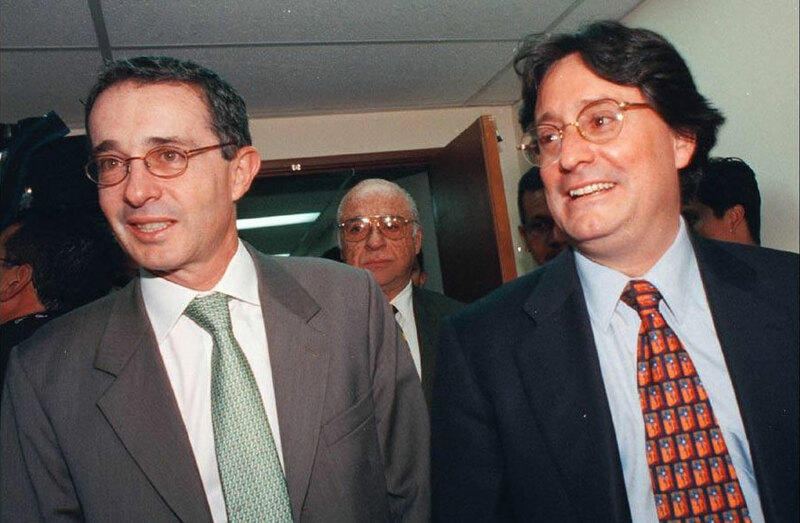 In 2008, Uribe cited a justice reform to assume almost absolute power when his cousin Mario was on trial and the first evidence appeared in the press that the military was killing of thousands of civilians. The court struck down the decision half a year later, claiming that a justice reform did not merit giving the president almost absolute powers. Senator Alvaro Uribe (L) and US ambassador Francisco Santos in 2002 when they were respectively president and vice-president. Duque, Uribe and their hard-right Democratic Center party, a.k.a. 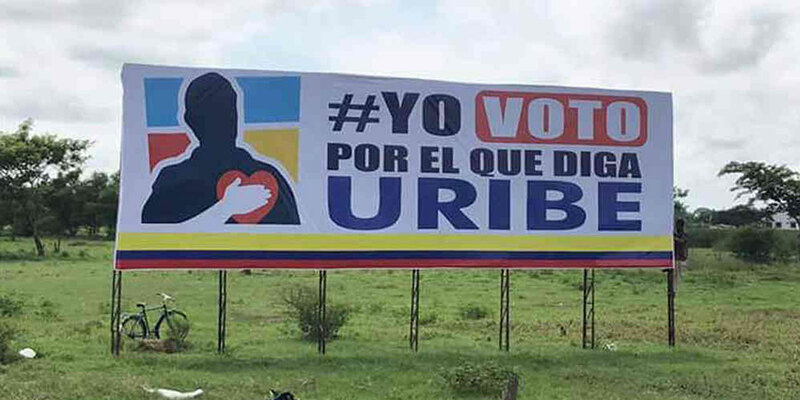 “the uribistas,” are again pushing major justice reforms, again while they are under investigation either by the Supreme Court or the war crimes tribunal that is part of the peace process. The court has also proposed to abolish the Supreme Court that is investigating Uribe, his brother and multiple sponsors and political allies of the president. A war crimes tribunal that seeks to clarify tens of thousands of was crimes committed by the guerrillas, the state and paramilitary death squads. Many senators, including within the government coalition, oppose the attempts of the president and his party to withdraw from elements of the peace process that could harm their political future and that of thousands of business owners. Is there a pretext to bypass congress? Duque took office on August 7 after he joined Uribe’s eight-year opposition to his successor Juan Manuel Santos and the 2016 peace deal with the FARC that ended an armed conflict of more than 50 years. Last year, Colombia recorded its lowest homicide rate in the history of homicide rates amid efforts by local communities, the military, the Santos administration and the international community to begin executing the 14-year peace process. But as violence reached all-time lows, the country’s illicit drug industry potentially produced 1,300 million kilograms of cocaine in one year an historic record. Illegal armed groups violently took control of former FARC territory to protect and expand social, political, economical and criminal interests after the state failed to assume territorial control. Duque wants to deploy the military to forcibly eradicate and fumigate coca crops, the basic ingredient for cocaine, but can count on major and possibly violent resistance from both coca growers, drug traffickers and the armed groups that “protect” them. According to the medical examiner’s office monthly report, Colombia saw an 8.5% increase in homicides between January and August this year, compared to the same period last year. Hundreds of community leaders and human rights defenders have been killed since 2016, and hundreds of people, including politicians and journalists have received death threats. 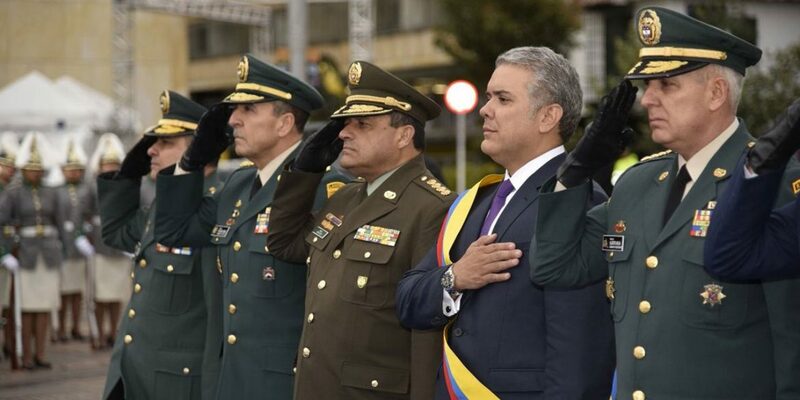 The government’s urgent need to produce results in the reduction of both post-FARC violence and drug trafficking could provide Duque with the pretext to decree a state of emergency, and push through his party’s radical agenda. With the exception of the Uribistas and the United States, Duque can count on relatively little public or political support. Within society and congress there is opposition to the government’s aggressive policies and the Democratic Center’s attempts to form a one-party government. Duque may have won the presidency, but progressive anti-corruption and peace advocates are stronger than ever in Congress. The UN, the European Union and many individual countries have nothing to do with the problems of Duque’s political patrons and sponsors, and have put their money on the peace deal. US ambassador Kevin Whitaker has stayed in the background since his was formally fired in February last year, but was never effectively replaced. To rule by decree might be Duque’s only option if he wants to push through his party’s hard-line agenda, much of which can not count on the majority approval in Congress. Has Colombia become ungovernable for Duque? He also has the country’s worsening security to deal with. The temptation of the readily available emergency decree is big, too big for his political patron, and political and economical interests are high.